As we reflect and renew commitments to God in this conclusion of Holy Week, allow me to offer a couple of thoughts, based on this foundation idea. It is possible for us to create powerful and unhealthy bonds with people over open or untreated wounds. Jesus initiated this powerful bond with us through intercession. He was wounded because of our rebellious deeds, crushed because of our sins; he endured punishment that made us well; because of his wounds we have been healed. Desire to heal comes from and through deep compassion for another’s helpless and broken state. Jesus took wounds for us as intercession, as the sacrifice on our behalf. It pleased God to bruise Him and receive His perfect sacrifice to turn God’s wrath from us. Many “connect” on wounded foundations and think they find friends. We exchange experiences, share close moments and build some community. But when apart, the others’ wounds stay with us, get in us and contribute to tension or strain with those tied to the wounds. While apart, we treat others differently based on what we were told, not what we know firsthand. Do not build a nursery for other’s wounds. Instead, present those wounds on a prepared altar before God. 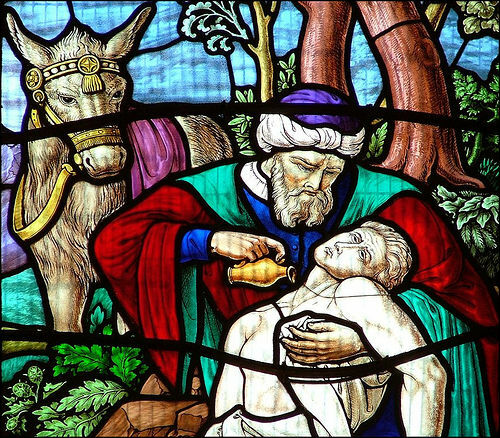 Today, many try to demonstrate Isaiah 53:5 in the spirit of the Good Samaritan (See Luke 10:30-37). But let’s match the intention with the right Word. Let’s be responsible intercessors and follow the model. We should have no trophy room of others’ wounds. Success is the wound becoming ashes on our altar of prayer…with no trace or resemblance to its original form. Amen to that! Let’s be good neighbors and create healthy, sustainable community in the Body of Christ. How? By looking to the needs of others’. We move in deliverance, yes, and oh how that’s necessary. But let’s ALL move in healing too. Let’s look on each others’ wounds with compassion and move in with oil and wine, AS THEY ALLOW US TO SHARE THEIR LOAD, and provide places of rest for recovery. Please consider it. We will all be better if we do. Love to all this Resurrection. ← Dear Prayer Leader, move the service forward.